What do I see in Pandan reservoir? I see despair. I see hope. Unlike most other reservoirs in Singapore, Pandan reservoir isn’t surrounded by trees or forests. It has a gravel track all around, and is surrounded by residential and industrial buildings. The atmosphere there is somewhat dismal, despondent and depressing. Yet the reservoir seems to serve as a sort of oasis or soul respite for the migrant workers who work in the industrial areas nearby. Displacement and migration from their home countries to work in a foreign land in austere conditions isn’t really fun for them. Yet there is a sense of brotherhood and camaraderie among the strollers. I see despair and I see hope. Yes, awakening is a process, so it is natural and understandable that we no longer are driven by what drives the world, such as status, achievements, and so on, as we embark on an ongoing journey of discovering our outer purpose. I decided to google to find out what he meant by inner and outer purpose, and I learnt from this article that our inner purpose is Being whereas our outer purpose is Doing, and I agree somewhat with this statement: “Outer purpose can change over time and is unique for every person. Inner purpose can shed light on your outer purpose”. 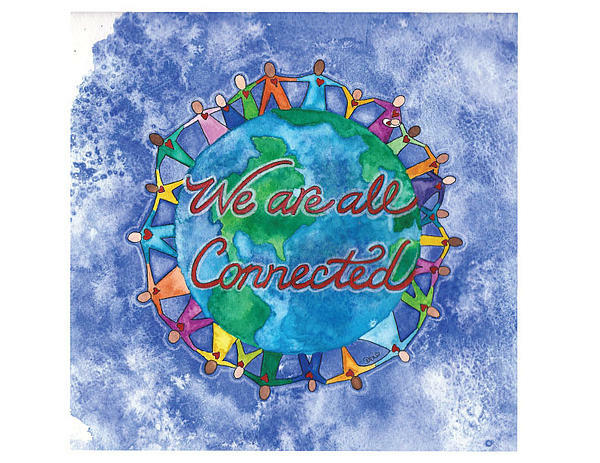 I believe our part is to focus on and rest in our inner purpose of being who we really are – the eternal, authentic, timeless, magnificent divine self – and embrace and love ourselves for who we really are, and we will naturally be living and aligning ourselves with our outer purpose in the here and now. For some reasons, this adage somehow came to mind – “Life is not measured by the number of breaths we take, but by the moments that take our breath away.” Maybe it sums up the primary purpose of life – to live in the present moment with wide open wonder and awake to and relish the everyday miracles of breathing the fresh air, enjoying the trees and flowers, and the rest are secondary. “So many of us are trying to be somebody, accomplish something…. But sometimes we get to a point where we give up on all of that… because achieving and obtaining things… feels kind of pointless after a while. So we start letting go of things we don’t even like… people who don’t totally love us… stuff we just don’t care about…. Then we end up creating space for ourself… space to feel… and be… whatever we want…. And that’s when we wake up. We wake up to this blissful, tranquil, higher consciousness… which is really just our self…. our real, honest, perfectly imperfect self…. And we find out we were there all along…. Yes, the societal notions of “somebody” and “accomplish something” are based on subjective opinions of other people regarding what they deem as important in life, but we are all here to live our soul purpose and create our own meaning, and so we can choose not to subscribe to societal expectations of us. Indeed, achieving and obtaining things feels pointless after a while because the statuses, titles, material possessions and so on are impermanent and are subject to change or decay over time, and do not add to or define who we are in our true essence. Thus, it is truly liberating to see through the illusion of material success, artificial identities, social constructs and separateness to realise our “real, honest, perfectly imperfect self” is there within us all along, and realise that regardless of what we do in life, where we were born, and which gender we are considered to belong to, and so on, we are all equal and we are all one. Cycling has given me the opportunity to muse and contemplate about life in general, as well as about death. Having commuted to school and work by bus and later by MRT train all my life until I reached the age of 40, I have never gotten so up close and personal with other vehicles on the roads until I started cycling on the roads. But first, let me reminisce a bit about the early days when I first learnt cycling as a young boy before I move on to recollect the first few times I tried to cycle on the roads. One of the earliest memories of cycling I had was when I was in East Coast Park learning how to cycle and balance on a bicycle. My neighbour’s dad was kind to teach me how to cycle. Inevitably and understandably, falls from the bike for a beginner tend to abound, and I remember there was once I lost my balance and fell on my right side. Instinctively, I stretched out my right hand to stop the fall. I landed squarely on my right arm, and fortunately the grass helped cushion the fall somewhat and I remember I wasn’t seriously injured. However, that episode might explain the reason why I suddenly experienced frozen shoulder on my right side many years later, which has recovered only up to around 90-95% by today. 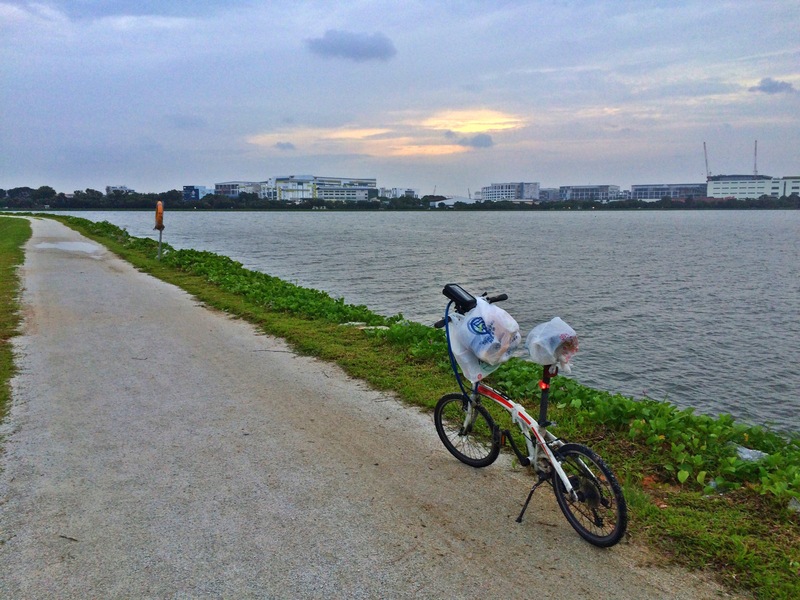 Another early memory I had was also in East Coast Park, except that I didn’t have the opportunity to cycle then and there. I must have been in Primary 5, and my class was supposed to go through this Road Safety programme through role play. I had wanted to play the role of a car driver or cyclist, but ended up being selected to play the role of a pedestrian. Man, I was so disappointed at that time, and I could only watch with envy my classmates who drove or cycled. Well, fast forward some 30 years later, around end 2013, I found myself being entrusted with a second-hand Hercules bicycle by a friend and former colleague who decided to go back to India indefinitely and planned to return to Singapore some time in future. At long last, my wish to cycle regularly has been fulfilled. In order to help look after it and not let it rust and deteriorate, I decided to take it for a regular spin, or should I say, for a ride. 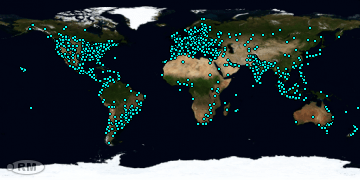 The rest, as they say, is history, and may I add, geography. I added Geography because cycling enables me to explore the terrain of Singapore in ways I couldn’t have done by walking or taking public transport. For a start, I began to know the gradient of slopes of pavements and roads around my neighbourhood and beyond more intimately. I would hardly have felt the strain of walking upslope unless the slope is significantly steep, like at Bukit Timah Hill or Mount Faber, but cycling has a way of making even the slightest rise in slope angle felt, especially since the bike itself is a rather heavy steel mountain bike with a front basket (a.k.a. market bike). 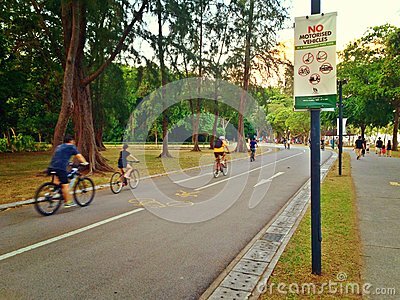 There were many times I felt as if I was riding or driving a tank uphill, such as when I was cycling along Rifle Range Road or Mount Pleasant Road or the like. So anyway, I started with pavements and car parks in my early regular cycling days, which naturally function as a kind of baby swimming pool for toddlers and young children who are learning to swim for the first time, where it is safe and presents little or no risk of drowning. I rode the bike almost solely on pavements and PCNs for the first 6 months or so, and it was mostly uneventful with hardly any mishaps or accidents, except for a slight stumble here and there over uneven ground or sharp corners when turning. Just as naturally, as my confidence and curiosity to explore new lands grew, I began to cycle further and further. Roads were a new territory to me, and the idea of cycling on the roads felt like entering deep waters of the sea for the first time, where there may be dangerous creatures such as jellyfish and sharks. The minor roads in my neighbourhood were relatively tame, like a lagoon with gentle waves, but the main roads such as Upper Thomson Road and Braddell Road felt like choppy waters of the sea initially. I made sure I cycled along the pavements beside these main roads many times and observed the nature of the traffic first before I finally dove into the proverbial sea. It was only a matter of time I decided to buy my own bike, and I got a second-hand mountain bike with a front basket and rear rack – perfect for running errands but not so ideal when I want to cycle long distance with slopes within a certain time frame, as compared to a lighter and faster road bike. Still, it served its purpose well most of the time, and I used it for commuting to work. Some months later, I saved enough to buy a reasonably light second-hand foldable bike, and alternated between using the foldie and the MTB for commuting and running errands. 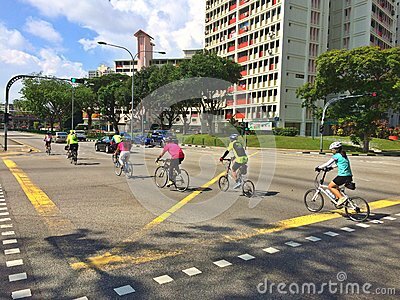 So, is cycling on the roads in Singapore safe? I would say it depends on many factors such as skills and experience, familiarity with roads and traffic conditions, and so on. Practice makes perfect, as they say, so the more often one rides, the better one gets in maneuvering the bike on the roads, if one diligently acquaints oneself with basic road safety guidelines and learns from experience and observation. Precision riding, for example, came with practice for me. (It is probably redundant for me to say this, but I thought I would mention this for emphasis.) The first few times I tried cycling on the road, I couldn’t do a proper turn at a road junction, and nearly hit a kerb once. In fact, the few accidents or falls I had on the roads so far all had mostly to do with my own mistiming or misjudgments about the distance I need to keep from the roadside or surrounding vehicles (I collided into a stationary car’s sideview mirror once, and another time, I was sideswiped by an overtaking car), or about the unevenness of the road surface (I lost balance when the bike wheels skidded on the jagged protruding edges of some recently laid and dried bitumen on the road), and so on. Motorists by and large do give me sufficiently wide berths when overtaking me, and I only need to make sure I am as visible as possible (such as by having front and rear bike lights on when it is dark) and as predictable as possible (such as giving hand signals when changing lanes wherever possible) and so on. With practice, road cycling can become as second nature to us as it is for mountain goats to traverse mountain slopes and cliffs seemingly easily and effortlessly. 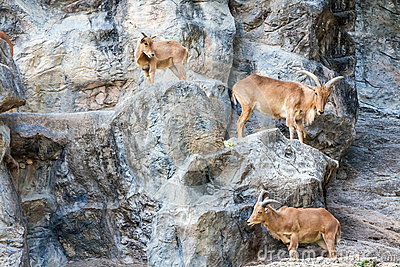 To us, it may look dangerous for mountain goats to live and move about on steep hillsides and cliffs but to them, it is home. Similarly, as long as we continue to ride defensively and practise mindfulness for the safety of ourselves and others, we can indeed cycle safely on the roads in Singapore, with or without dedicated bike lanes (since at this point, it is still uncertain when these will finally materialise on the mainland).